In June 2018, the Supreme Court of the United States issued its landmark ruling in South Dakota v. Wayfair, Inc., where it held that states can impose sales tax on purchases made from an out-of-state seller, even when the seller has no physical presence in the taxing state. This ruling does not replace prior sales tax law; instead, it adds to the existing list of physical presence and other activities that create sales tax collection, remittance, and filing requirements. Sold taxable goods and services for delivery into South Dakota in 200 or more separate transactions. Post-Wayfair, a majority of states have enacted sales tax laws similar to South Dakota; the remaining are expected to follow. As a result, many businesses are now required to file sales tax returns and collect and remit sales tax in states where their only activity is sales to customers who reside in those states. In addition, businesses with zero taxable sales, such as manufacturers, wholesalers, and other non-retail businesses, may still be required to register and file zero tax returns to be fully compliant under a state’s sales tax law. Under an audit, sellers are generally liable for uncollected sales tax from customers who did not pay sales tax at invoice or supply a properly completed sales tax exemption certificate. As a result, all businesses should be reviewing their sales tax exemption certificate management processes. Out-of-state sales tax compliance requirements have significantly increased for businesses. Trout, Ebersole & Groff, LLP is recommending, as soon as possible, that all clients evaluate the impact of these new state sales tax laws on their out-of-state sales activities. There is no statute of limitations for unfiled returns, and any unpaid sales tax liabilities will compound indefinitely against noncompliant businesses. Upon inquiry, states will generally issue a maximum sales tax assessment with full penalty and interest. In these situations, businesses are directly liable for a tax that could have been collected from their customers. In addition, non-filing of zero taxable sales could result in penalty assessments. Our State & Local Tax team at Trout, Ebersole & Groff, LLP continues to monitor developments and guidance from the various state revenue departments, as they continue to decipher the Wayfair decision. If you would like to discuss how the Wayfair decision impacts your business or if you have concerns with any of your company’s other state and local taxes, please contact Monte Anderson, CPA, MAc at 717-358-9136 or manderson@troutcpa.com. Below is a more in-depth explanation of this landmark case. Today, small and medium-sized businesses are regularly interacting with out-of-state customers, suppliers, and partners through the aid of modern technology. Sales transactions are often completed through internet, telephone, and mail order channels, where goods are shipped directly to customers by third-party shippers. This type of transaction, where sellers and customers are geographically divided, is referred to as remote selling. Sales tax nexus describes the level of connection between a taxing jurisdiction and a business that is necessary for a state to impose its sales tax. Before June 2018, a longstanding U.S. Constitutional interpretation had determined that remote selling activities (i.e. making sales without physical presence in a state) would not establish sales tax nexus. Consequently, taxpayers lacking physical presence outside of their home state had no obligation to register, collect, and remit a state’s sales tax. Traditional sales tax nexus resulted when company sales representatives, employees, or agents (including company-owned vehicle delivery drivers) traveled into a state at the company’s direction, thereby establishing physical presence for the company. This so-called physical presence rule was intended to protect businesses from the undue burdens of out-of-state sales tax compliance. On June 21, 2018, the Supreme Court of the United States ruled in South Dakota v. Wayfair, Inc. that economic contacts alone can establish substantial nexus for sales tax purposes. This economic nexus is determined simply when a company’s total revenues, or number of transactions, in a state exceed a specified threshold. Sales tax economic nexus is not established for a remote seller that does not exceed the above revenue or number of separate transactions threshold. Because Wayfair is a case that was decided by the Supreme Court of the United States, all states are free to adopt their own economic nexus laws. 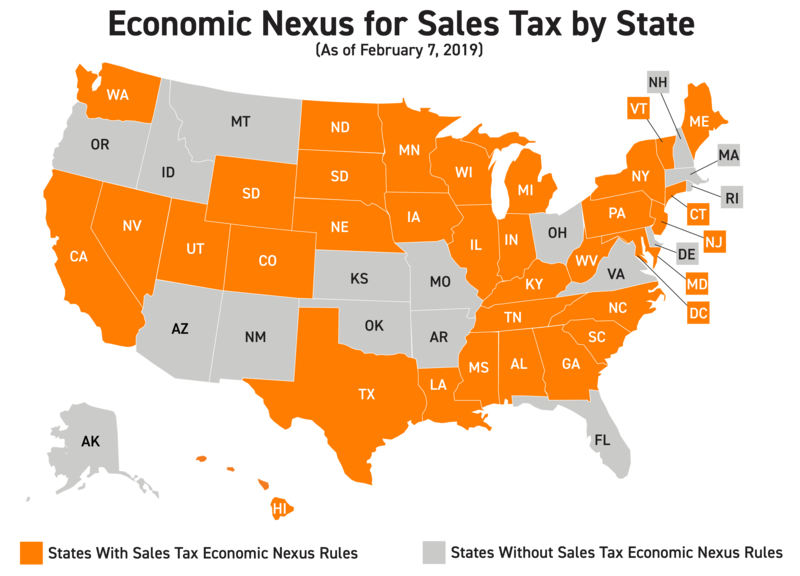 Since June 2018, the majority of states have already enacted economic nexus laws for sales tax and the remaining states that impose a sales tax are expected to follow. Similar to South Dakota, many of the new state economic nexus laws have opted to use a threshold of gross revenue exceeding $100,000 or 200 or more separate transactions in the state. Through remote selling, even small companies may have considerable out-of-state sales without ever having company employees or agents physically present in those states. As a result, many small businesses may now be required to collect and remit sales and use taxes and file related returns in states where they merely have sales to out-of-state customers. As we continue to follow developments and guidance from the various state revenue departments, we are finding that sales tax economic nexus compliance may have further implications for manufacturers, wholesalers, and other nonretailer businesses. Manufacturers, wholesalers, and nonretailers often sell goods and services to customers in tax-free exchanges. Instead of charging the necessary sales tax at invoice, these sellers obtain a sales tax exemption certificate. A sales tax exemption certificate is required for all sales of taxable goods and services where sales tax is not charged at invoice. Upon an audit, sellers are generally liable for uncollected sales tax from customers who did not pay tax or supply a properly completed sales tax exemption certificate. Enacted state economic nexus provisions vary by state. Many states have opted to include resale exempt sales in their economic nexus threshold definitions, while others include only taxable sales. As a result, manufacturers, wholesalers, and nonretailers with zero taxable sales and substantial resale exempt sales in a state may still be required to register and file zero tax returns to be fully compliant under a state’s economic nexus law. Currently, marketplace and direct-to-consumer sales may be a normal part of nonretailer business activities. Many nonretailers have at least some level of direct retail sales to customers, as a way to develop more business. Post-Wayfair, all retail sales to customers in other states are potentially taxable sales. Correspondingly, even a small amount of retail sales can create a recurring tax collection and reporting requirement in a state that determines its economic nexus threshold based on gross sales. Sales tax exemption certificate processing requirements also vary by state. For manufacturers and wholesalers, whether you have received an exemption certificate in proper form may not always be a simple determination. Sellers that drop ship goods on behalf of their customers should take extra care to obtain proper exemption documentation for these sales. A number of states will hold a seller that drop ships goods responsible for the collection of sales tax, if the seller accepts a resale exemption certificate from an unregistered customer. Post-Wayfair, all nonretailers should be reviewing their exemption certificate management processes to identify, understand, and correct all noted deficiencies. Nonretailers should also be evaluating the extent of their out-of-state retail sales to customers and the potential tax implications of those sales. There is no statute of limitations for unfiled returns, and unpaid sales tax liabilities will compound indefinitely against noncompliant businesses with sales tax nexus. Upon inquiry, state departments of revenue will generally issue a maximum tax assessment against a noncompliant business, with full penalty and interest. Upon assessment, these noncompliant sellers are directly liable for a tax that could have easily been collected from customers and remitted to the inquiring state. As economic nexus continues to expand its reach, businesses should be aware that their out-of-state sales activities may be increasingly subject to inquiry and audit by the various state revenue departments. Potential out-of-state sales tax compliance obligations have significantly increased for many small businesses, as a result of the Wayfair decision. We are therefore recommending that all clients with out-of-state sales make an initial determination on the impact of state economic nexus laws respective to their out-of-state sales activities. This should be completed as soon as possible. Identifying the states where gross revenue exceeds $100,000, or separate transaction count exceeds 200, for the most recent annual reporting period. Determining if economic nexus has been established by reviewing the economic nexus laws of each identified state and comparing the state law to the identified revenue and transaction information for that particular state. Deciding how and when to comply in states where economic nexus for sales tax has been established. While $100,000 or 200 transactions is generally the lowest economic nexus threshold that will trigger a state collection and reporting obligation, some individual state thresholds may be higher. Also, keep in mind that a seller of lower value goods may exceed 200 transactions with gross revenues that are significantly less than $100,000. 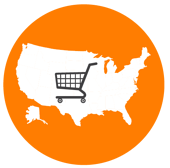 To familiarize yourself with a specific state’s sales tax economic nexus law, see Avalara’s Remote Seller Nexus Threshold Chart. This reference provides a state-by-state map and an up to date summary reference chart on remote seller nexus. Nonuniformity of state reporting rules, sales tax law complexities, and unique business transaction profiles may require consulting with a qualified CPA firm for help with this assessment. Additionally, the economic nexus ruling in Wayfair does not replace prior sales tax law; it adds to the existing list of physical presence and other activities that have traditionally created sales tax nexus. TEG is available to assist you and answer questions as you navigate the complications of an economic nexus assessment for sales tax. The State and Local Tax (SALT) team at Trout, Ebersole & Groff, LLP continues to monitor developments and guidance from the various state revenue departments, as they continue to decipher the South Dakota v. Wayfair decision. If you would like to discuss how economic nexus impacts your business or if you would like assistance with your company’s state and local tax concerns, please contact our SALT Manager, Monte Anderson, CPA, MAc at 717-358-9136 or manderson@troutcpa.com.